The Salt Cave is a one-of-a-kind place designed to promote and support relaxation and general wellness. 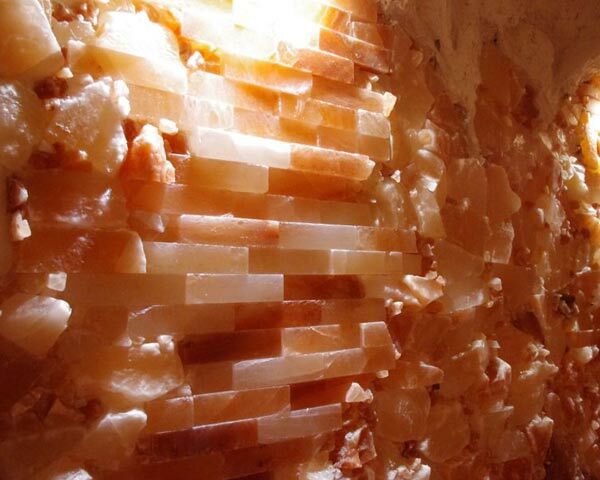 The walls and floor were constructed by hand using more than six tons of pure Himalayan crystal salt, and the air in the cave is treated by a specialized halogenerator, which infuses the air with a dry aerosol containing tiny particles of pharmaceutical grade salt. Clinical studies have shown that when people inhale this type of salt air, it can help to stimulate the natural ability of their respiratory system to reduce inflammation, fight infection, clear blockages and reduce discomfort. Visitors typically spend each 45-minute session relaxing in a comfortable zero-gravity recliner. Alternately, special group sessions might include yoga/meditation or storytelling for kids. In all cases, the primary source of respiratory benefit is the inhalation of the cave's specially treated salt air. Below is a list of conditions that have been shown to respond to salt cave therapy. Visitors with a chronic or specific health condition are advised to direct specific questions about salt therapy to their physician as needed. Salt therapy is most prevalent in Russia and Eastern Europe, where doctors have routinely prescribed it for over a decade. While every session is beneficial, multiple sessions allow most people to experience a period of remission from their conditions. Below is a list of conditions and the suggested number of consecutive sessions, as used in Russian clinics and health spas. These numbers should not be treated as prescribed medical standards, but rather as suggested guidelines for treatment based on research (see citation below). Visitors to the Salt Cave should be attentive to their own unique needs/conditions and make decisions about treatment based on the way their bodies respond. Methodical recommendation was discussed and approved by the Scientific Board of the Institute of Pulmonology of the Russian Federation.